Neil Gaiman has long been inspired by ancient mythology in creating the fantastical realms of his fiction. Now he turns his attention back to the source, presenting a bravura rendition of the great northern tales. In Norse Mythology, Gaiman fashions primeval stories into a novelistic arc that begins with the genesis of the legendary nine worlds; delves into the exploits of the deities, dwarves, and giants; and culminates in Ragnarok, the twilight of the gods and the rebirth of a new time and people. Gaiman stays true to the myths while vividly reincarnating Odin, the highest of the high, wise, daring, and cunning; Thor, Odin's son, incredibly strong yet not the wisest of gods; and Loki, the son of a giant, a trickster and unsurpassable manipulator. 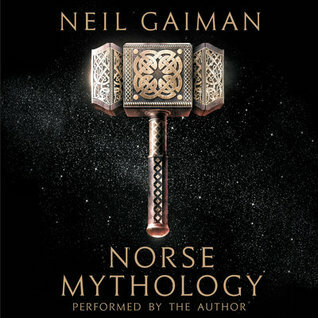 The book begins with an introduction from Neil Gaiman, a brief explanation of how Gaiman found himself researching into the various translation of Nordic myths and legends and giving the Gods their voices. 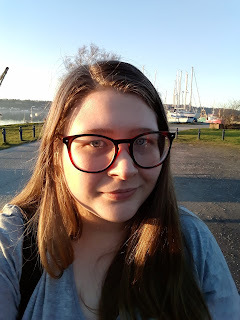 It was a brilliant way in which to draw me into the book, find my footing with Gaiman's narrative voice and gave me the little backstory that I didn't know I wanted until I had heard it. Would this be an audiobook review if I didn't mention Neil Gaiman's exceptional narration? He's already up there as one of my favourite authors, but the more I listen to his books (which I should mention all have Gaiman narrating at least some aspect) he's making his way into a favourite audiobook narrator. If you rememeber, a couple of months ago I read and reviewed Joanne Harris' Runemarks, but lacked the heart to give it a raving review. Now, I'll let you into a little secret - I read this alongside Runemarks, and while I usually struggle to read two books set in the same area of myth and legends at the same time, the complete stark difference on the taking of the stories made it easy for my brain to grasp them as individual stories rather than merge them in my mind. What has that got to do with this review? Well, I thought a little comparison might help with the actual review process. Norse Mythology is written in the style of a short story anthology, that all weave together to create a timeline of the Gods before Ragnorak. And I really liked that. I could dip in and out of the stories as I pleased and makes for a great touchstone and valley into Norse Myths. I really liked how Gaiman fleshed out the characters of the Gods, bringing them to a contemporary audience. Sometimes retellings of myths, like this, can fall a little flat and left to only be characterized by their name and what they're the God of.